OS grid reference: NY 2540 1641. In the valley of the river Derwent, in Borrowdale, just north of Rosthwaite in a woodland clearing on the opposite side of the road from the river, stands a huge glacial boulder shaped like a human head that is one of several Cumbrian curiosities and, which has locally been called The Bowder Stone or Balder’s Stone, after the son of the Norse god, Odin (Woden). This ice-borne rock was carried down the valley by a glacier many thousands of years ago and deposited having been trapped and then dislodged between the two side-slopes of the river valley. Today, the massive rock has become a tourist attraction and a photographer’s delight! And many antiquarian writers have travelled here to see the stone and maybe “try”and measure its height and girth, and to be amazed at this wonderous geological curiosity. The village of Rosthwaite is 1 mile south on the B5289 road and Grange is roughly one and half miles north-west, while the town of Keswick is 5 miles in the same direction from here. The Bowder Stone is 36 feet high (10.9 metres), 62 feet long (18.8 metres) and 90 feet (27.4 metres) in circumference though ‘a few’ might, perhaps, argue with these approximate measurements! It is said to weigh somewhere between 1,970 to 2,000 tons, give or take a few! Geologically speaking the huge rock was brought to its present position by a ‘retreating glacier’ moving south from Scotland during one of a number of Ice Ages 12,00-15,000 years ago; this being a well-known fact because the rock is not from the local area, which is largerly volcanic in its geological make-up. It is a free-standing erratic in that it does not touch the surrounding rocks, but simply balances and pivots deep in the ground beneath it. 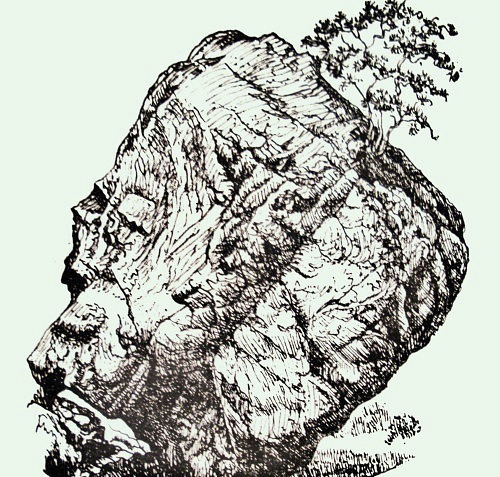 The rock is shaped like a human head, or several heads with faces – you can easily see a nose, eyes and mouth on at least three different parts of the stone if you look closely at it, indeed you might see more than three! A step-ladder allows access to the top of the stone where a good panoramic view can be had of the Derwent Valley and Upper Borrowdale; the various marks and holes in the stone have been made by climbers. There are other glacial erratic rocks close by, but none of them quite as big as The Bowder Stone. The Ward Lock Red Guide (Lake District) 1975 sums up the rock quite nicely: “A mile from Grange Bridge and immediately beyond a large slate quarry is the famous Bowder Stone, a remarkable rock of prodigous bulk, which lies like a ship upon its keel.” And author Maxwell Fraser in his book ‘Companion Into Lakeland’, 1939, says: “The chief tourist site of Borrowdale is the curious geological feature, the Bowder Stone, a poised block of stone 36 feet high which is reckoned to weigh 1,970 tons.” In the great Arthur Mee’s book ‘Lakeland Counties’ we are told about one ancient curiosity of Borrowdale, Castle Crag, a nearby Iron-Age hillfort, and then the author goes on to say: “Another is the curious Bowder Stone, an immense boulder of about 2,000 tons……, which after rolling down the fell-side, has remained balanced on an edge so narrow that through a hole in it two people can shake hands”. According to tradition, two people holding hands through the opening at the bottom of the rock and then making a wish, shall have that wish come true. Fraser, Maxwell., Companion Into Lakeland (Second Edition), Methuen & Co. Ltd., London, 1939. Mee, Arthur., Lake Counties, (Seventh Impression), Hodder And Stoughton Ltd., London, 1961. ‘Lake District’ Ward Lock Red Guide, (edt by Reginald J.W. Hammond), Ward Lock Limited, London, 1975. The Illustrated Road Map Of England & Wales, The Automobile Association (AA), London, 1962. Geograph © Copyright Graham Hogg and licensed for reuse under this Creative Commons Licence. 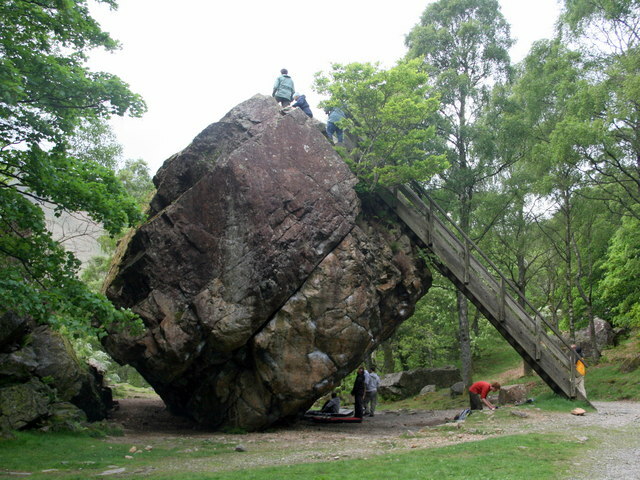 Categories: Glacial Erratic | Tags: The Balder Stone in Cumbria, The Bowder Stone at Rosthwaite in Cumbria | Permalink.